SCOTTSDALE, Aariz.--(BUSINESS WIRE)--This Chinese New Year, P.F. 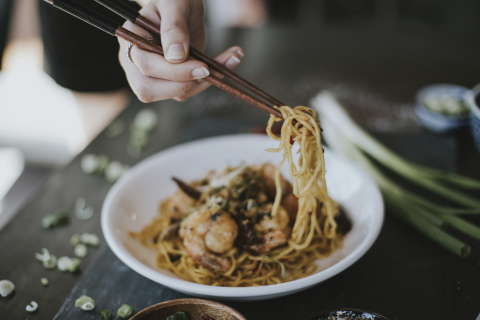 Chang’s is spreading deliciously good fortune across the globe by sending one lucky winner and a guest to China for a seven-day trip to include dinner at P.F. Chang’s new Shanghai restaurant, the brand’s first restaurant in China. Ten lucky people will also win P.F. Chang’s for a year ($2,600 value), 1,000 will win P.F. Chang’s gift cards, and everyone who spins the fortune wheel at ChineseNewYear.com will win free Street Fare or Dim Sum with any entrée purchase. Guests who share a Chinese New Year wish on Twitter or Instagram using #ChineseNewYear will be entered to win one of ten $100 gift cards. Chang’s Lettuce Wraps - In Cantonese, the word for “lettuce” sounds like “rising fortune.” So, the more you eat, the more fortune you will have. 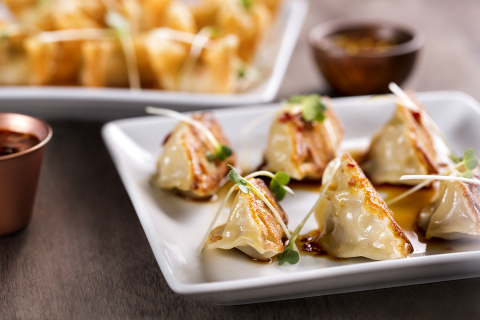 Cecilia’s Dumplings - Shaped like gold and silver coins from ancient China, dumplings symbolize prosperity. As they are stuffed and folded, each by hand, wealth and prosperity are sealed inside. Long Life Noodles & Prawns - Longer, uncut noodles symbolize longevity. Tradition has it that eating a bowl of noodles could increase your lifespan. Kung Pao Chicken - In Chinese culture, Kung Pao means "hot firecrackers" which are lit during the New Year to scare away evil spirits. Our fiery woks help bring this made-from-scratch dish to life and will cast away all evil. Mongolian Beef – According to Chinese tradition, vegetables purify and cleanse the body and soul. Pick up your chopsticks and grab a bunch of our nutrient-rich green onions in this classic handcrafted dish. Oolong Chilean Sea Bass - Serving fish is symbolic of prosperity, so having this dish at the dinner table is regarded as a promising way to start the New Year. Great Wall of Chocolate - Cake’s sweetness symbolizes a rich, sweet life, while the layers represent rising abundance for the coming year. P.F. Chang’s Shanghai restaurant is scheduled to open in the first quarter of this year, and is one of almost 100 locations outside the U.S.
Dine in or carry out guests who visit P.F. Chang’s between January 22 and February 16 will receive one red fortune cookie per guest. All fortune cookies will contain a prize, but only 10 will be golden fortunes, containing one of the most coveted Chinese New Year prizes: Free P.F. Chang’s for a year ($2,600 value). For a chance to win P.F. Chang’s trip for two to Shanghai, China, guests can register to win at ChineseNewYear.com. This prize includes airfare, seven nights of hotel accommodations, spending money and dinner at P.F. Chang’s new Shanghai restaurant. Everyone who registers to win will get a free Street Fare or Dim Sum reward to use with the purchase of any entrée during a future visit, valid for two-weeks from the contest registration date. Visit ChineseNewYear.com for sweepstakes rules and further details. Founded in 1993 by Philip Chiang and Paul Fleming, P.F. Chang’s is the first multi-unit restaurant concept in the U.S. to honor and celebrate the 2,000-year-old tradition of wok cooking as the center of the guest experience. Since inception, P.F. Chang’s chefs have been hand-rolling dim sum, hand chopping and slicing all vegetables and meats, scratch cooking sauces and wok-cooking each dish, every day in every restaurant. P.F. Chang’s Farm to WokTM menu highlights its wholesome, scratch-cooking approach and introduces new dishes and drinks for lunch, happy hour and dinner. Today, P.F. Chang’s has more than 300 restaurants, including three airport locations, in 22 countries and territories. For more P.F. 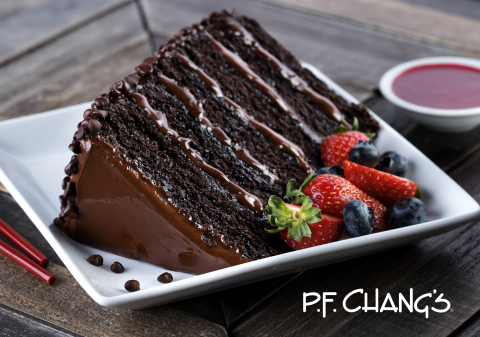 Chang’s news, promotions and store openings, or to make reservations, visit pfchangs.com and follow us on Facebook, Twitter @PFChangs and Instagram. Celebrate Chinese New Year with P.F. Chang's for a chance to win a trip to Shanghai, P.F. Chang's for a year, and one thousand other prizes.